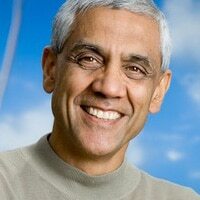 EMV will become irrelevant in three to five years’ time and NFC will take over, Khosla Ventures founder Vinod Khosla has told attendees during a keynote at Money20/20. “All these backroom boys agreed on something and missed one thing — what does the consumer want to do,” Khosla said in answer to a question about the introduction of EMV in the US. Hmm, who am I to doubt the super successful Mr. Khosla…but it sounds likes crazy talk. It’s true that adoption of something entirely new can be rapid (e.g. Facebook); but change, especially when it’s dependent on physical stuff (i.e. NFC devices) is always painfully slow. 3-5 years – no way. 10 – yeah maybe; but then NFC will be very old (it’s already old). NFC is just the communication channel, you still need EMV for the security part. Yup, technically different layers like you say, but I think in this instance Mr K used the term “EMV” to refer to chip and pin/sig cards.